RT television network and Ora TV announced a deal today that will bring legendary broadcaster Larry King to US cable television’s RT America. Beginning in June, “Larry King Now” will be carried on RT America. Additionally, RT will air “Politics with Larry King”, a new show also hosted by King and produced by Ora TV. RT America will be the exclusive US broadcaster for both programs, which will continue to stream online at Hulu.com and Ora.tv and also be available online on rt.com. The programs will be recorded in RT America’s Washington, DC studios and Ora TV’s studio in Los Angeles. “I have interviewed every US president since Nixon, and lest people forget, I helped usher Ross Perot into the national conversation during the 1992 presidential contest. I appreciate the importance of providing a platform to those with real alternative visions for our country’s future,” says the host. RT will air the new show ‘Politics with Larry King’, produced by Ora.tv in June as well as ‘Larry King Now’, which was launched on Hulu and Ora.TV in July 2012. The programs will be recorded in RT America’s Washington, DC, studios and Ora TV’s studio in Los Angeles. RT America will be the exclusive US broadcaster for both programs, which will continue to stream online at Hulu.com and Ora.tv and also be available online on rt.com. 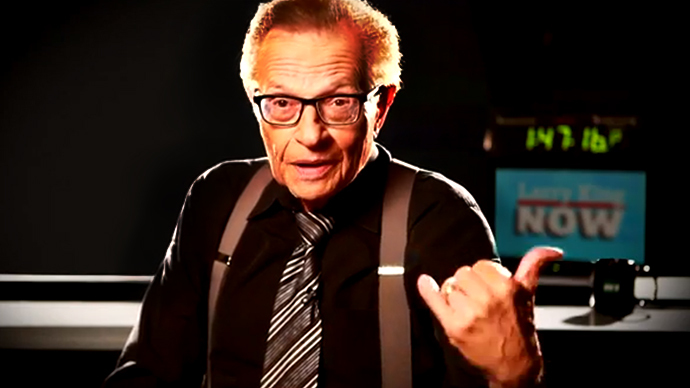 Larry King has retained his trademark suspenders worn through his 25 years on CNN (he quit the news network in 2010), but has not been afraid to show a more opinionated and frank side, which he says is a must for the new media age. “Whether a president or an activist or a rock star was sitting across from him, Larry King never shied away from asking the tough questions, which makes him a terrific fit for our network,” says RT’s Editor-in-Chief Margarita Simonyan. “Larry King has entertained and informed millions of viewers over the years, and millions of digital viewers over just the past year,” adds Ora TV’s CEO, Jon Housman. Larry King Now, which will air four times a week, sees the broadcaster sit across the table from some of the most talked about celebrities in the world (recent guests have included Seth McFarlane, Snoop Lion, and Floyd Mayweather) and take them beyond the standard soundbites. Larry's abrupt return to television unleashed a torrent of reactions, both in Russia, where he widely-known as an ultimate figurehead of US broadcasting, and in his homeland. Through the day, Twitter was awash with comments on King's new place of work that ran the gamut from appreciative to surprised to irreverent.